Faeces contains a complex mixture of chemical compounds, including substances from the diet and digestive processes. By better understanding the biology of extinct animals we can gain insights into how they interacted with their environment and potentially why they became extinct. Dr Gill’s research lies at the interface between palaeontology and chemistry. She uses organic geochemistry as a tool for investigating interactions between microbes and animals in the fossil record. 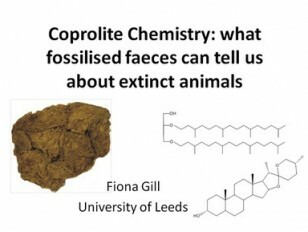 Her current research focuses on the chemistry of modern and fossilised faeces (coprolites).